Viking River Cruises has a new itinerary in France for 2014 that looks as though it will satisfy all the senses. 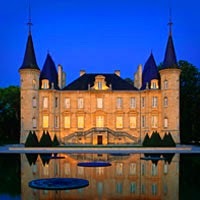 The eight-day cruise ‘Châteaux, Rivers & Wine’ on the Dordogne, Garonne and Gironde rivers allows guests to enjoy the beautiful landscapes and history of Bordeaux and the Aquitaine region, while exploring some of the world’s finest names in wine, such as Margaux, Pomerol, St. Emilion and Sauternes. The eight-day cruise journey begins in Bordeaux and makes its first stop in Pauillac, where guests can try the full-bodied blends of the renowned Médoc and Margaux wine regions and travel along the famed Route des Châteaux for an insight into château life. It then sails to the citadel in Blaye and the charming town of St. Emilion (both UNESCO World Heritage sites) before continuing on to picturesque Cadillac for a taste of sweet Premier Cru wines from the Sauternes region. The voyage concludes with an in-depth tour of the beautiful churches, grand Louis XV architecture and charming cafés of Bordeaux. Viking Foresti while deployed in Germany. Guests sail on Viking Forseti, the first time of Viking’s new Longships to sail in France. Local experts along the way are set to introduce passengers to regional culture. Guests may learn to make tender canelés, a caramelized custard pastry, observe the winemaking traditions that have made the area so famous, begin or expand their appreciation of fine Bordeaux wines with the guidance of a master sommelier. You can also brush up on conversational French with optional on board lessons. Captain River and River Cruise Insight will be bringing you a first-hand account of this river cruise in late March. Stay tuned for plenty more, including a ship review, information about the destination and personal insights into what this river cruise entails. If you’ve been to the Bordeaux region and feel you have something to add, please comment below. Our readers appreciate your advice and memories.